This is a guest blog post from Ryan Stevens, Senior Analyst at Clutch. 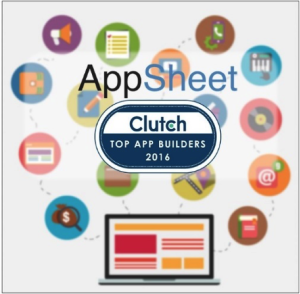 AppSheet has made the list of top mobile app builders from ratings and review firm Clutch. This list includes many proven companies that provide high-quality services and deliver first-class products. Dependent on feedback from customers and ease of use of our platform, AppSheet’s presence on the list is a great accomplishment for our young company. As an app builder that takes a commonly used tool—the spreadsheet—and turns it into a functional app, AppSheet’s strength is in keeping the process of building an app building an app incredibly simple. Customers rave about the company’s transparency, reliability, and straightforward platform. Anyone familiar with Excel or Google spreadsheets can use AppSheet and create an app in just five minutes. It doesn’t take an ounce of code or knowledge about app development. AppSheet does the hard part, so customers can transform their everyday data into a business app. Washington D.C.-based Clutch combines the helpfulness of real customer experiences with market and business insight. After looking at dozens of DIY app creator platforms, AppSheet stood among the best in customer support, features, and applicability to a wide range of users. To read the reviews or submit your own, check out Clutch and all of the AppSheet Reviews.